Ravenol is a 70 year old German oil company and one of the most dynamic brands for premium lubricant products in the world. Ravenol is also acknowledged as a global player who manufactures and markets high-quality lubricants and additives with an enviable reputation in over 80 countries. “Made in Germany” Ravenol engine oils and additives are developed to meet the specific requirements of manufacturers and their advanced technology not only meets, but often exceeds, the latest requirements of today’s modern vehicles. 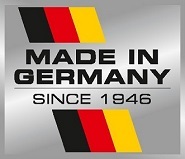 Ravenol branded products carry approvals for many of the world’s major manufacturers including Daimler Benz, Volkswagon, BMW, Porsche, Volvo, Chrysler, MAN, Cummins, and ZF. Their products are also listed by API and ACEA. This large number of OEM Appovals confirms the high quality of Ravenol products. Ravenol is also rapidly becoming one of the world’s most popular brands in motorsport. Their involvement includes, Lemans 24 Hour, Audi Sport TT Cup and the highest single seater categories below Formula 1. Today, the extensive motor-racing involvement of Ravenol comprises of more than 100 race series worldwide. Why should you use additives? Quality engine oil is designed to perform a variety of vital actions such as keeping moving parts lubricated, reducing engine friction and transferring heat. However, oil alone cannot keep your engine running as efficiently or at its peak performance. True, approved quality oils will perform to the manufacturer’s specifications but these properties can be further enhanced by using fuel and oil additives. By using additives it is possible to add extra properties that enable your engine to run at its best and make certain the functional service life of your engine is maximized. Contamination of fuel and engine particles reduce performance over time, however by using a Fuel System Cleaner and Engine Cleaner at regular intervals you can be sure your engine is running smoother, performing at its peak and providing better fuel efficiency. Performance driving and heavy loads like those found in some LCV’s and towing applications demand more from your engine and wear occurs at a faster rate. Ravenol fuel and oil additives, in combination with Ravenol specified motor oil, ensures optimum performance of your engine and can offer an economical long term solution with reduced major repairs required. So, if optimum engine performance is important to you then you should be using purpose designed additives from Ravenol. RAVENOL Diesel System Cleaner is added to the diesel fuel. RAVENOL Petrol System Cleaner is added to the petrol. For all petrol injection engines with or without catalytic converter. RAVENOL Professional Radiator Stop Leak is a dispersion for protecting the cooling system and the combustion chamber against leaks and increasing operational safety. RAVENOL Professional Radiator Stop Leak permanently seals hairline cracks and leaks. RAVENOL Professional Radiator Stop Leak prevents seals from sweating and the loss of coolant. RAVENOL Professional Radiator Stop Leak is suitable for closed cooling systems. RAVENOL Professional Radiator Stop Leak is added to the radiator. If there are filters in the cooling system, a radiator jointing material may not be used. RAVENOL Professional Radiator Cleaner is a radiator cleaning additive, which is used for the quick and easy cleaning of the cooling and heating system. RAVENOL Professional Radiator Cleaner breaks down and binds greasy and oily deposits in radiators, heating systems and pipelines. RAVENOL Professional Radiator Cleaner infiltrates and eliminates sludge and corrosion deposits. RAVENOL Professional Radiator Stop Cleaner neutralises lime residue. RAVENOL Professional Radiator Cleaner is added to the radiator. It is recommended to replace rubber parts affected by oil seepage. 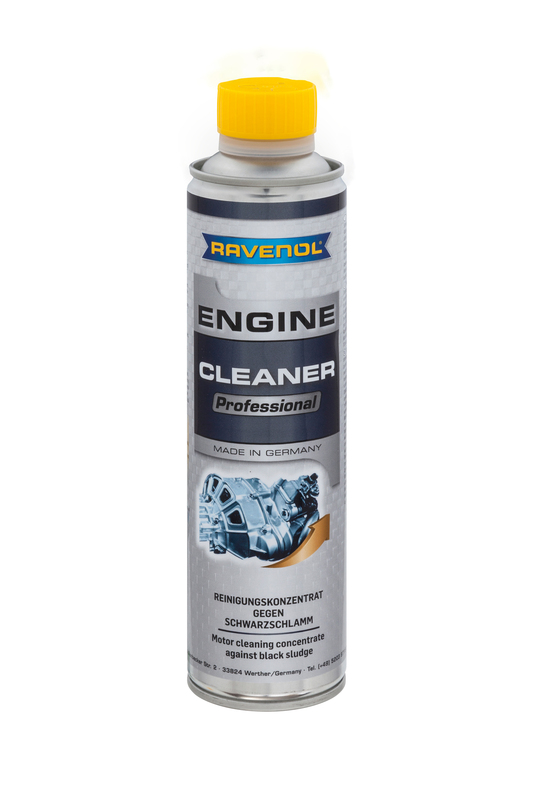 RAVENOL Professional Engine Cleaner is active concentrate for longer oil cleanliness for all petrol and diesel engines (with and without catalytic converter). RAVENOL Professional Engine Cleaner can also be used in motorcycles, except motorcycles with wet clutch. RAVENOL Professional Engine Cleaner effectively breaks down dirt accumulation and sludge deposits in the engine compartment using intensive-cleaning tensides and removes these effectively when draining used oil. RAVENOL Professional Engine Cleaner cleans and rinses the entire engine system. RAVENOL Professional Engine Cleaner is added to the warm motor oil. Ravenol’s range of products are eco-friendly and designed to have low environmental impact. There is no better example of this than Ravenols revolutionary Bag–in-box 20L container system. Simply the Ravenol Bag-in-box system is made up of a robust outer box and a plastic bag that has an integrated outlet tap. This oil container system is not only space saving but offers a sustainable disposal of the packaging components. The system saves up to 80% space with the empty packages as compared to package containers of the same packaged size. This state of the art container system is further enhanced with a space-saving shelf system. 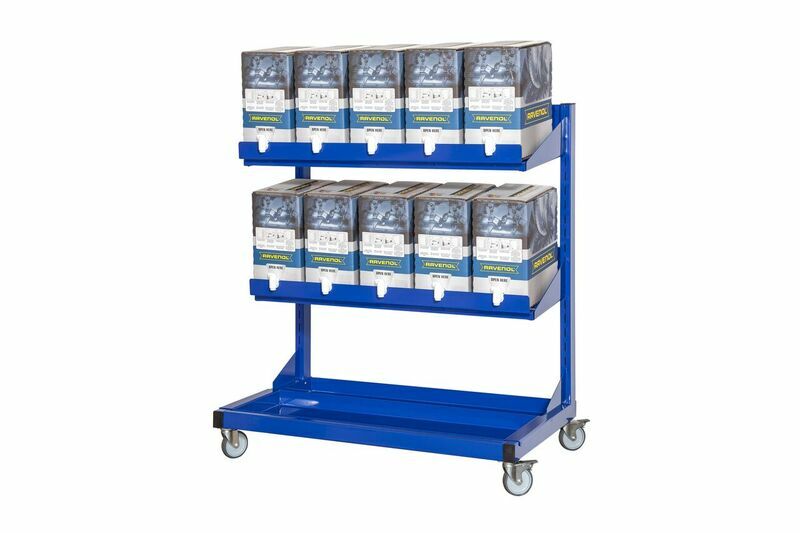 The shelf system has the capacity to store 10 x20L Bag-in –Box Cartons. Once the bag is empty, it can easily be removed from the outer box for recycling. The outlet taps are cleverly suspended which ensures simple and clean bottling of the product, the system comes with a removable drip pan for easy cleaning and has fastening casters to easily move around the workshop.